--The people who do understand what we've lost are the ones who are rushing around in a frenzy trying to save the bits that are left. --Up until that point [the extinction of the dodo] it hadn't really clicked with man that an animal could just cease to exist. It was as if we hadn't realised that if we kill something, it simply won't be there any more. Ever. As a result of the extinction of the dodo we are sadder and wiser. --We are not an endangered species ourselves yet, but this is not for lack of trying. Liz Baldwin of BiodiversityWorks presents her research and other insights into the natural history of our local otters. At the O.B. Library; call 508 693-9433 for more info. Also, the following week (Thurs., Aug. 8), same time and place, Luanne Johnson talks about the natural history of the striped skunk. Thursday, Aug. 1, 3:30 to 4:30 pm, V.H. A hands-on learning program with Gus Ben David of World of Reptiles and Birds. At the Vineyard Haven Library; call 508 696-4211 for more info. A free guided walk at Sheriff's Meadow Foundation's Caroline Tuthill Preserve in Edgartown, hosted by SMF staff. For more info call 508 693-5207. Saturday, Aug. 3 at 9:30 am, V.H. Vineyard Power Co-operative's 4th Annual Members Meeting and election of Directors is at the Katharine Cornell Theater in Vineyard Haven. Vineyard Power is currently circulating a petition (viewable here, reload the window after opening) to further their efforts to compete successfully for offshore wind rights. A free Felix Neck program that explores a different aspect of Sengekontacket Pond each week. From the birds above, to the creatures below the water's surface, this program includes hands-on activities for ages 4+. Meet at the Little Bridge (north end of State Beach). Sponsored by Friends of Sengekontacket. For more info, call 508 627-4850. Free educational program from Felix Neck on the amazing things you can find in a sample of ordinary soil. At the Edg. Library; for more info, call 508 627-4221. Stephen Kellert presents his insights into Biophilia, the theory that humans are inextricably connected to nature. For an introduction to the concept, see our interview with Dr. Kellert (a recent addition to the VCS Board) from last fall. $10/$5 for PHA members; for more info, call 508 693-9426. Wednesdays and Saturdays, 9:00 to noon at the Grange, West Tisbury. Every year, for a few weeks in the summer, I get to know a new set of high school interns. This year's group, like many before them, has an approach to eating vegetables that could described--to put it gently--as apprehensive. Like one might approach an angry but nutritious rattlesnake. Don't let this happen to kids you know! Early intervention with zucchini bread has been known for years to reduce the incidence of vegephobia in children. Age 6 is good, +/- 3 years. Sure, zucchini bread isn't particularly healthy in itself, but as a "gateway vegetable" . . . well, it has "zucchini" right there in the name! This, from Healthy Seasonal Recipes, is a good bit more wholesome than most recipes, but is still plenty sweet. See the link for preparation and an explanation of the healthy changes. 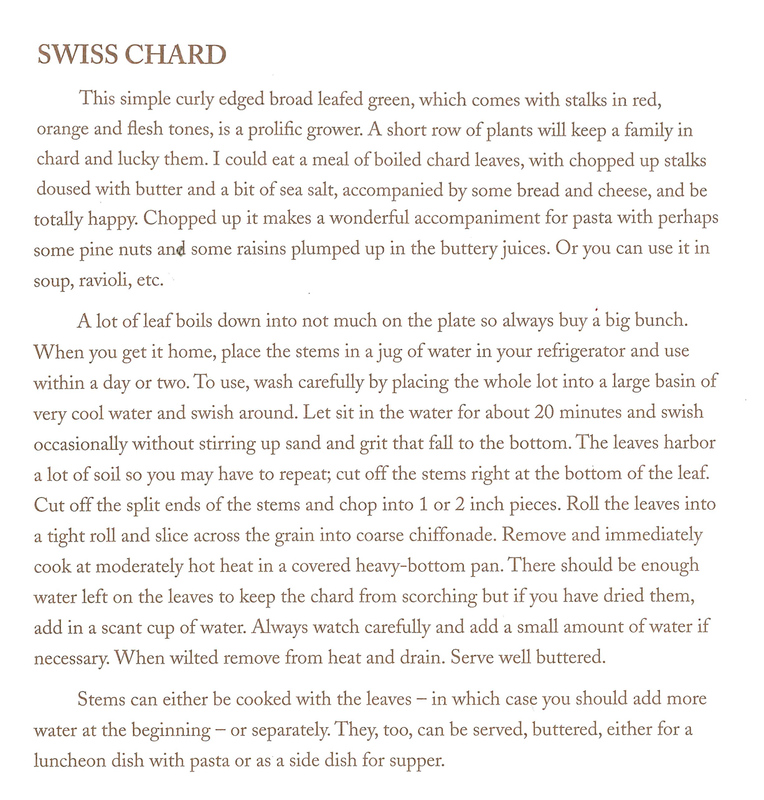 The previous issue of the Almanac promised "Swiss Chard Demystified," but did anything but that, accidentally omitting the excerpt from Ginny Jones' cookbook, Fresh from the Vineyard. If you missed it on our website, here it is now. Algae blooms in coastal waters are often the result of excessive nitrogen. Speaking at a recent meeting of the Lagoon Pond Association, Cormac Collier, Executive Director of the Nantucket Land Council, presented useful insights into possible regulatory approaches to curbing inputs of nitrogen into coastal waters. Mr. Collier’s presentation (full video here) was a thorough introduction to the environmental concerns of nitrogen pollution and their scientific basis, as well as an exploration of what solutions are available and how to get there from here. There was an excellent story in last week’s Gazette detailing the exploits of our Island’s Northeastern beach tiger beetle and the scientists who study them. Well worth a read, both for the cautionary tale of how even the smallest animals are threatened by coastal development, but also the resilience of this triumphant little predator. Believed to be extinct in New England but rediscovered in 1989, the species appears to be adapted to near-death experiences at the population level, at least those caused by natural forces. Hurricane Bob, for example, reduced the population by 90%, but it quickly recovered. For biological populations, there’s a sort of critical mass that must be maintained – a minimum number of individuals in contact with each other – or else there is a relatively high risk of extinction due to events that are more or less random (or stochastic, see second paragraph here). On one level, it’s just basic probability: a freakishly large storm, an outbreak of disease, or a severe food shortage is more likely to literally kill every single individual if there are very few of them. But also any survivors from a catastrophic event must be able to find a mate when the time comes, using the means of communication at their disposal, be it song, dance, chemical attractants, or something more unusual. And this can become impossibly difficult if a couple dozen tiny creatures are scattered across miles of habitat. Yet another concern with small population numbers is loss of genetic diversity: though the species may survive some natural disaster, re-populating from a tiny number of survivors may create a genetic "bottleneck," leading to a new population with less genetic diversity that is not as well adapted to survive the next catastrophe. Fortunately, it appears that this minimal viable population number is quite low for the Northeastern beach tiger beetle – maybe as low as a few hundred. That’s a nice cushion (and in truth the reason the species still exists today) but let’s try not to blow it by destroying the last scrap of habitat to which it has retreated – their Alamo, as described by VCS Annual Meeting speaker Paul Goldstein. The Gay Head Gallery is hosting a group art show Saturday, August 3rd from 5 to 7 pm to benefit two Island organizations tasked with protecting our sensitive and invaluable water resources, the M.V. Shellfish Group and Water Alliance. Many of the paintings in the show will depict places where erosion and storm damage have changed our coastline, and others will celebrate the beauty of our marshes and ponds. Impacts from storm damage on our surface waters and ponds will also be addressed. 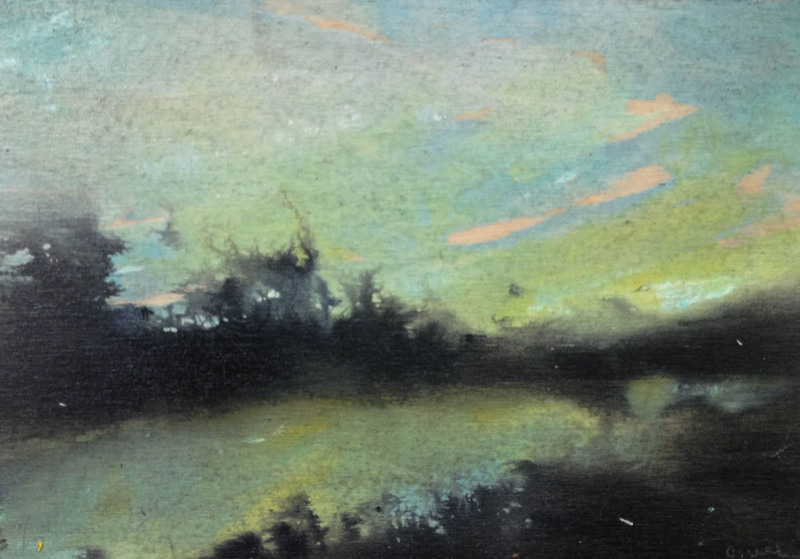 The show will feature work by Steven Kleinrock, Elizabeth Lockhart Taft, John Nickerson Athearn, Linda Thompson, Laura Roosevelt, Eleanor Hubbard, Ellen Liman, and Colin Ruel (whose work is pictured above). The Gay Head Gallery is located at 32 State Rd. in Aquinnah. For more information, contact Gallery owner Megan Ottens-Sargent at (508) 645-2776. Last week, a significant fire occurred on an offshore natural gas drilling platform in the Gulf of Mexico. While burning for about two days, major damage was done to the rig, and a relatively small amount of gas (compared to previous spills) leaked onto the surface of the water. No one was injured in the incident. The recent boom in natural gas production in the U.S. has been both a blessing and a curse, and the debate over which we should emphasize will continue for years. From the perspective of climate change, gas is clearly preferable to coal and oil, producing more net energy per unit of carbon emitted. On the other hand, the transition to natural gas could dull the enthusiasm for adopting truly carbon-free energy and keep our economy reliant on pumping carbon into the atmosphere further into the future.